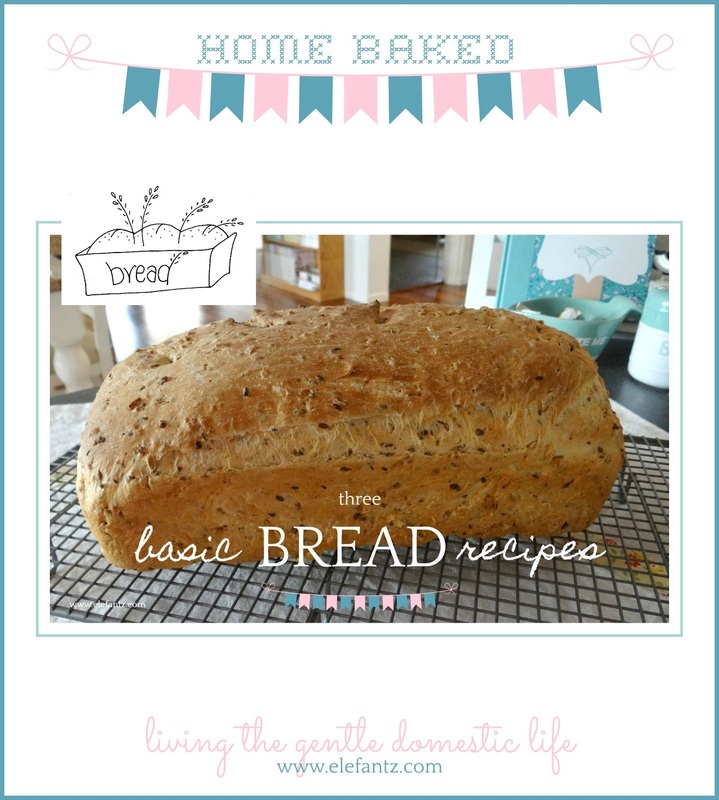 There's been a lovely thread or two about breadmaking on the Gentle Domesticity Group this week and I was asked to share my day to day recipe. I actually have three 'regulars', and I also make sour dough when I'm in the mood. But today I'll share the trio which make their way to our table every week and leave the sour dough until another time. You can download the recipes HERE and you'll find a cute little bread tin stitchery inside them. 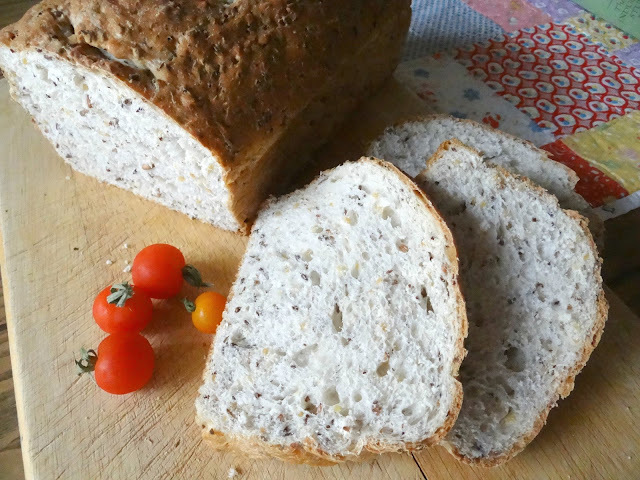 One of the questions asked was how I start my bread in the breadmaker but finish it by hand so yesterday during the most amazing downpour of rain I have seen in about five years I took some photos as I made our next loaf. I used to always knead my bread by hand, start to finish, with great delight. In 2010 I had an operation on one of my fingers and ever since have struggled to do two things, knead dough and knit. 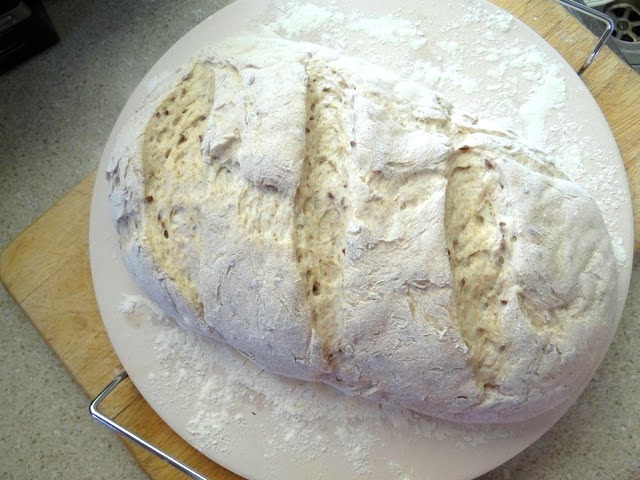 This was when I bought a breadmaker to do the kneading and also to take my loaf through it's first rise. So that's where yesterday's photos begin, after the first rise. On a breadmaker there's a number of options for baking bread, sometimes even jam, and I choose the "Dough" setting. I place all my ingredients in the pan, close the lid and press 'dough'. The machine then kneads the mix for about 20 minutes before going quiet and heating a little to allow the dough to rise before 'beeping' me that it's ready. This entire first process takes 90 minutes in my machine. Now I remove the tin of dough from the machine and spread my cleaned kitchen counter with about a tablespoon of olive oil. I pour another teaspoon or two into the tin I'll use to bake my bread. Smear the olive oil across the counter with your hands so that you also have the oil over your hands. 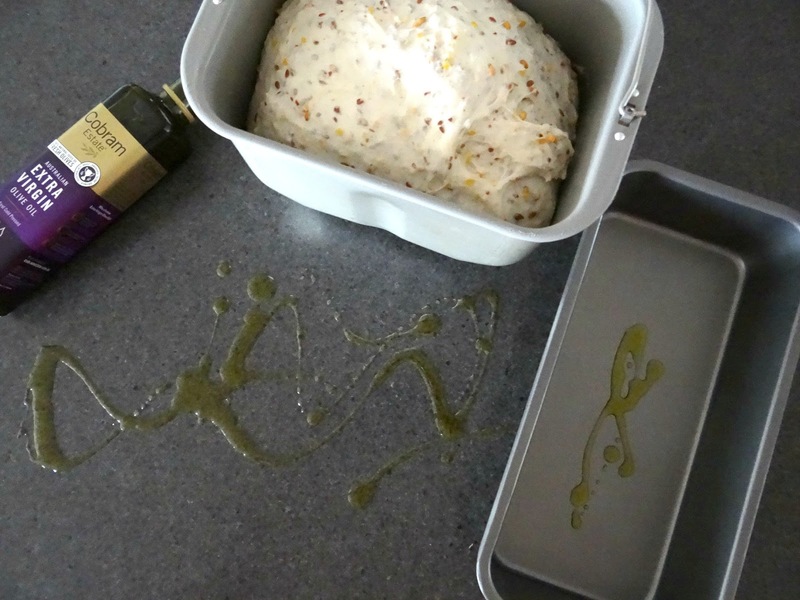 Spread the oil around the inside of the baking tin as well. ...and punch it down before kneading lightly for 20 seconds. Form the dough into a loaf shape and place in the baking tin. Gently push it around so that it fills to the sides. 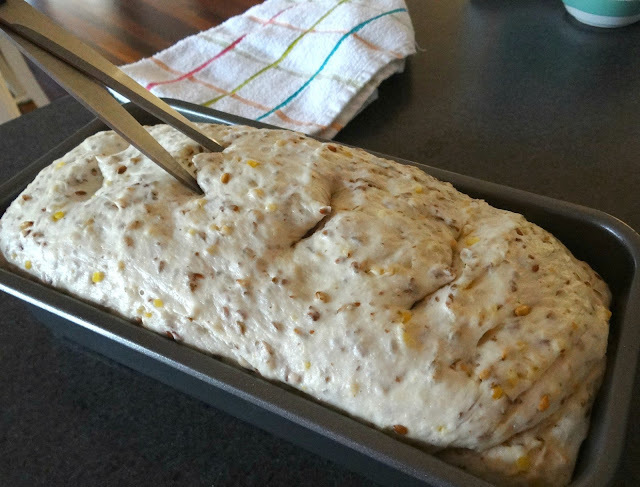 Place a plastic bag or cling wrap loosely over the loaf. I use a very large zip lock bag and I place a tall glass inside as well to prevent the dough sticking to the bag when it rises. Now we let the dough begin it's second rise. I live in a very warm climate and some days it can double in size within 30 minutes, but usually it takes about 45 minutes. 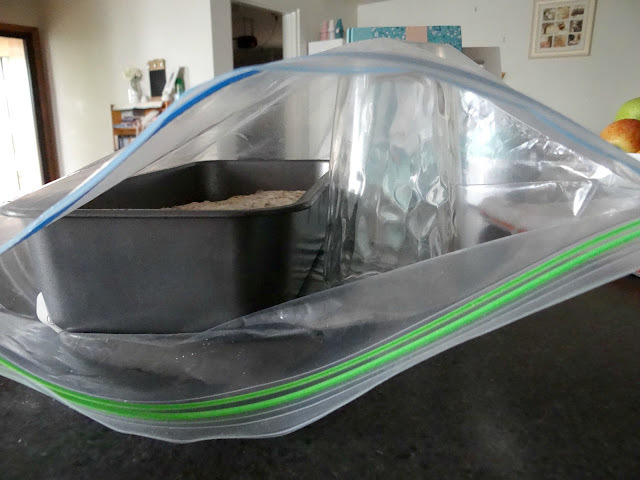 If you're in a cooler climate it may take up to 90 minutes or 2 hours but the plastic bag over the loaf helps it rise so give that a go as it may be quicker. Here's my dough doubled in size and ready to bake. I cut four little peaks into my loaf before popping it into the oven. I find this helps the loaf keep a good shape. Around 28 minutes later we have bread! 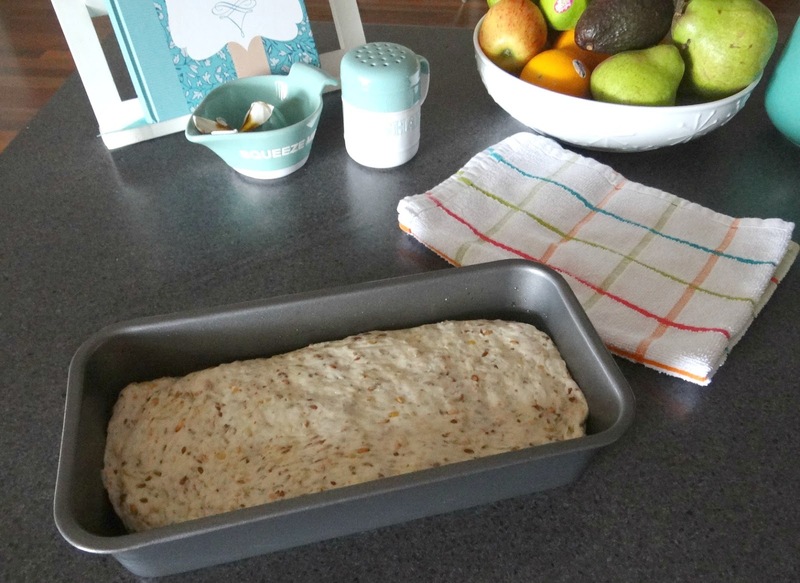 The tin I bake my bread in was a $6 purchase at Woolworths supermarket (Australia) and measures 11 1/4" x 5 1/2" (14 cm x 29 cm). My husband loves his bread and would eat it at every meal if he could. His favourite easy dinner is cheese and Vegemite on toast and he often requests these 'easy' dinners on a Sunday night. 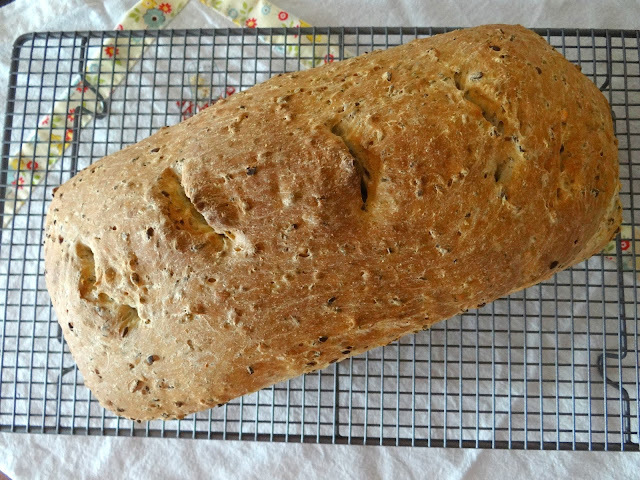 Sometimes I bake the dough on a hot stone, especially my sour dough, for a nice rustic loaf when serving soup or if we have guests. When I bake it that way I use a floured kitchen top and place it on a sheet of baking paper for the second rise and I cut three long slits diagonally across the top. 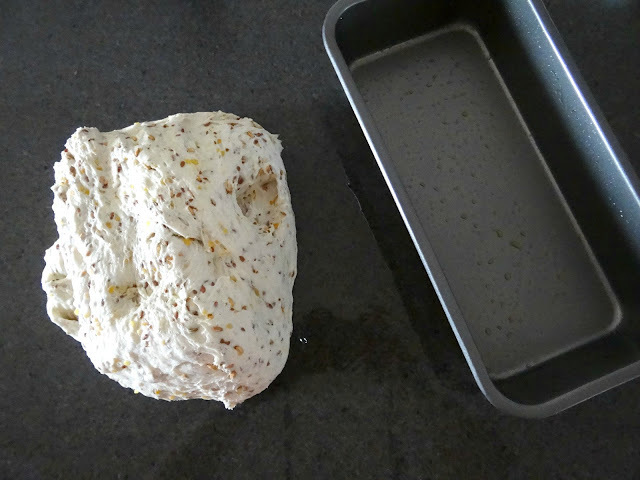 During the second rise I have the hot stone heating in the oven and once the dough is ready to be baked I take the stone out of the oven, scatter flour over it, and slide the bread off the baking paper and onto the stone before placing it back in the oven to bake my bread. Bread is delicious this way if you enjoy a crusty loaf! In fact, I'm going to bake tomorrow's loaf this way! Sometimes I serve it with homemade labneh instead of butter. Delicious with some olives, tomatoes, red onions and thinly sliced cold meats. As I was putting the recipes together I thought I'd share a little bread tin stitchery design from years ago which I used on a bread bag. When you download the recipes you'll see it on the back page of your Living The Gentle Domestic Life Cookbook recipe sheets. The rain this week has been incredible and there's more to come. What a blessing rain is when you are in drought. 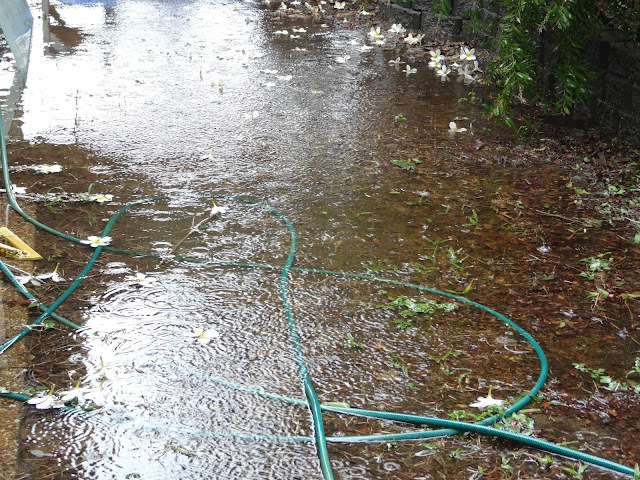 I stood outside yesterday and watched the frangipani flowers floating by under the clothesline and thanked God for His goodness, praying the rain is filling the town's dam as we've been on level 3 water restrictions for a very long time now and what was a lush green part of the country has been brown and parched for too many years. But I think most importantly about our farmers up here, the cattle farmers who watch their stock starve, and I pray their own dams are filling and that there will be many green pastures to follow. Of course, there's always a downside to a lot of rain. Like the local cane farmers who have had to pause their cutting season until things dry up. And the towns south of us who have had roads cut and are even experiencing floods. The cycle of seasons, rain and fire, storm and sunshine, flood and drought. May the Lord bless you as we say goodbye to another week and carry you through the next with an abundance of His grace, mercy, provision and love. Jenny your bread looks fantastic. We are having another sourdough workshop tomorrow and, according to the weather bureau, the rain will be back again as it is supposed to be really bucketing down. We have had a couple of days of fine weather to recover from the recent downpours but it was nothing like the weather south of you. I do hope you get some more into your catchment area. Your bread looks delicious, the second one looks like the loafs of bread we have here in Germany. I have a bread baking machine. It kneeds the dough and with the wormth it generates it lets the dough rise nicely. I like that machine and use it every time I make a yeast dough. I know I don't have the hand strength to knead dough, so I'm going to look for a breadmaker. I'd love to try this, thanks Jenny! May the Lord send just enough rain and not too much! Mmmm, looks so good! It is cloudy here today. When it is cloudy it kicks in my baking gene!!! I was thinking of making oatmeal raisin cookies and soft ginger cookies today. I have grandkids coming tomorrow and they are always hungry! I use a kitchen aide mixer to knead my bread for me. I also have a bread machine that I use if I want a fresh loaf for morning breakfast. I have thought of making bags for my bread. Does it keep the loaves soft or will they dry out? Thank you for the recipes and the little stitchery. I use a bread machine to knead my dough, too. Super easy and so delish! When I do the second rising, I turn my oven on the lowest setting for two minutes. Turn it off. Place the dough in the oven for about 30 to 45 minutes. Yummm. 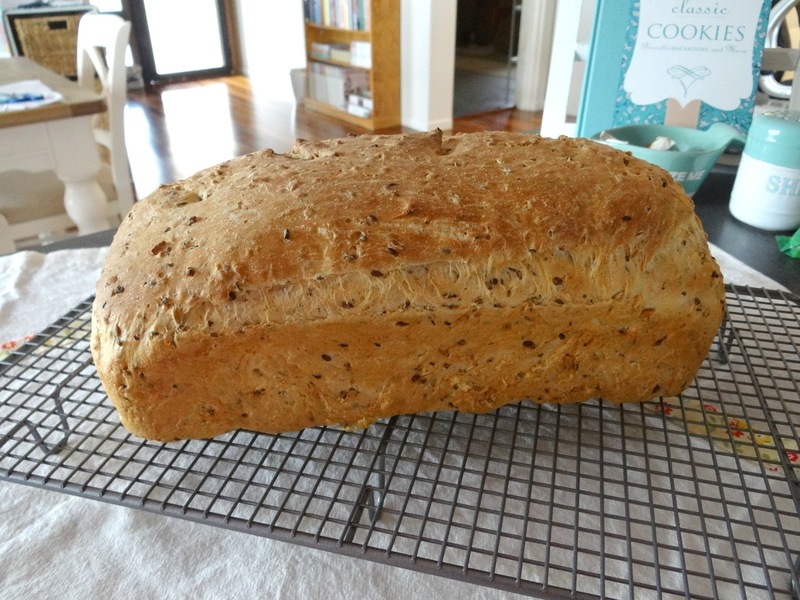 I love baking bread though it's usually a winter time activity for me. 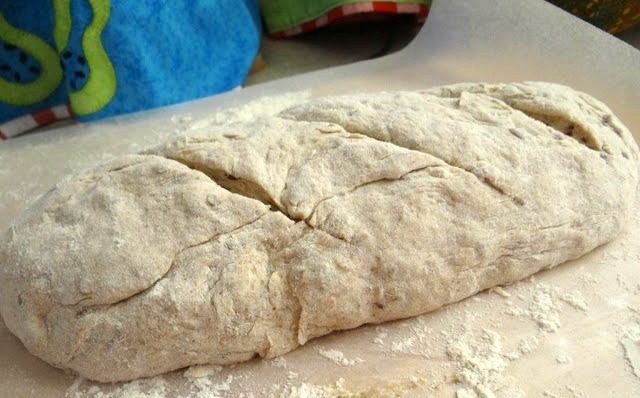 Kneading is my favorite part of the process; love the feel of the bread. 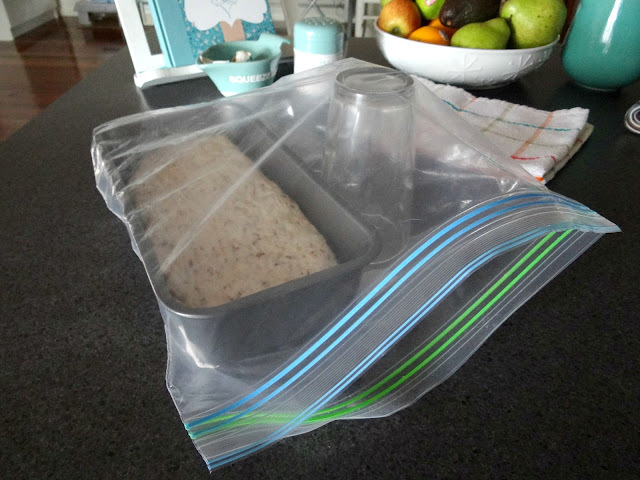 I've never used a 'bread bag'; a plastic Ziploc bag is what I've always used. Please, tell me about your 'bread bag' and why you use it? Does it do a good job of keeping the bread fresh and does it keep the cut end of the bread, from getting dried out? Would you share a tut for making a bag? Love your sweet stitchings and you lovely recipes. Thanks, Jenny. What a lovely post Jenny. 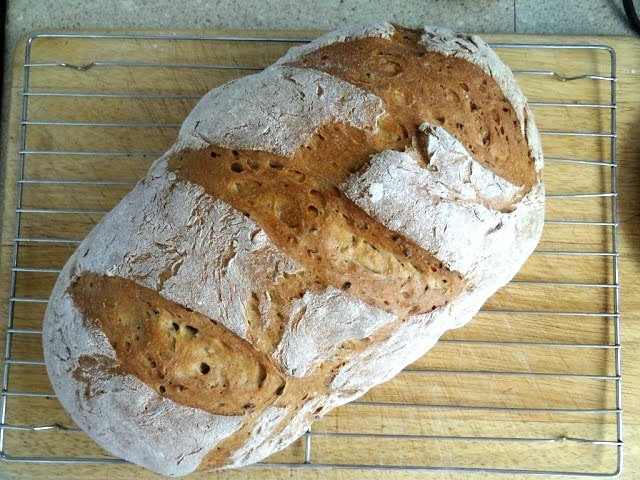 Gorgeous looking bread, fabulous with soup for the winter. It's the only tome I don't feel guilty about eating bread. Glad you're getting some much needed rain. That's one thing we never have a shortage of thankfully. I don't mind the rain and I love the smell after the rain. OH, thank you Jenny. Although I am not on FB, I was going to ask if you could give us your bread recipe. I have never heard of a bread bag other than the plastic bags bread comes in at the grocery store. So, I have the same questions as LJ does about the bread bag. Jenny thank you so much for the bread recipes and for the bread design stitchery. I look forward to making your breads. I bake breads from time to time. 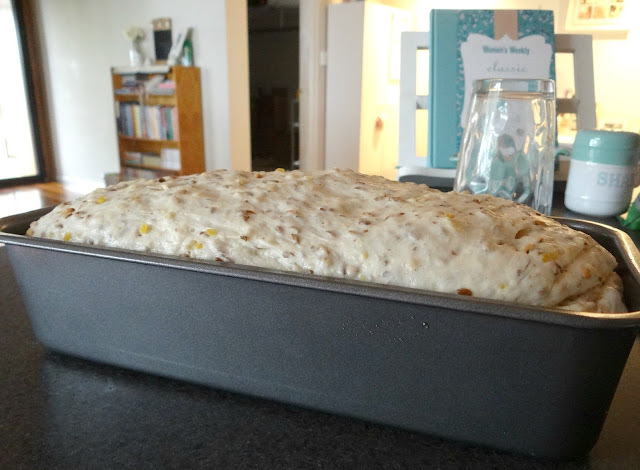 I made 2 loafs of banana bread this week. As the bananas my husband picked up from grocery store were too ripe when he bought them and considering none of us eat them ripe like that. They were gonna go to waste. So I made banana bread instead. My daughter came home from University for the weekend and she can take 1 loaf back with her to enjoy warmed in the microwave with a cup of coffee for her days she has early morning classes. Yes info please on your bread bag...I am very curious about this. 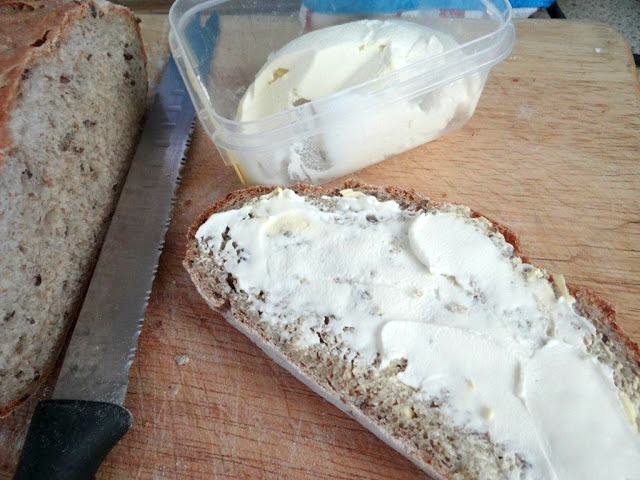 I also like to bake bread that I put cinnamon and brown sugar in and also bread with Italian herbs in it....We love bread...way too much with nice cold butter on top or the new coconut butter spread my daughter found that is delicious. Thank you for the recipes. What is the purpose of the cloth bread bag? Your bread looks delicious but not something I have made. In the 70s Mum used to make it in the slow combustion stove and it was lovely. Like Mr E I love cheese and Vegemite. It is my go to quick sandwich lunch. Enjoy your rain and the renewal of life that it brings. 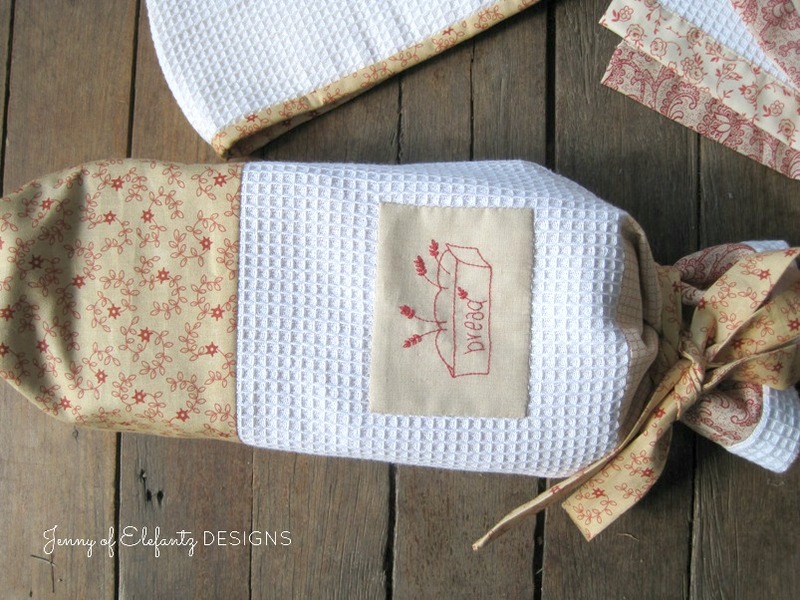 I have the same question as many have already asked, does the fabric bread bag keep bread better? Beautiful bread bag, wonderful stitchery. Thank you. I like the picture at the end of the puddle. Living in the desert for so long, I really learned to appreciate rain! 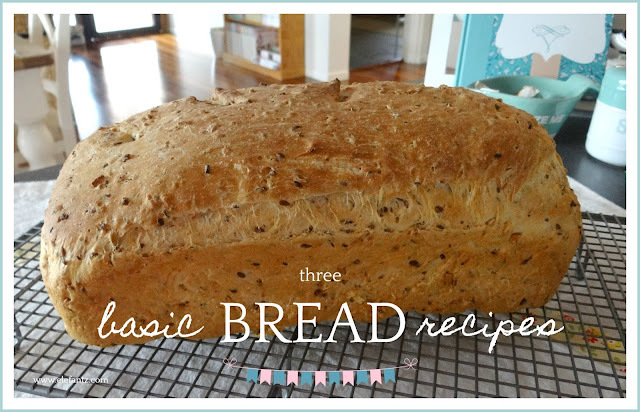 It was fun to see how you bake your bread and cut the slits. Thanks for sharing the wonderful pictures, and the recipe. Jenny, I love making bread too and have downloaded your recipes to try out. I think Blossom's favourite will be one of my favourites too.